General Suzanne Anton related to liquor policy changes. One recommendation endorsed by Clark's Liberals, the allowance of tastings and sales of craft beer at local farmers markets, has the executive for the Campaign for Real Ale (CAMRA) of BC smiling from ear to ear and I should know as I am one of those executive members. In a press release from the Office of the Premier and Minister of Justice, it was announced that, "(m)anufacturers will be able to sample and sell their made-in-B.C. liquor at venues such as farmers’ markets, festivals and off-site tasting rooms." This announcement, which the government hopes will help, "growth of the wine, craft brewery and craft distillery industries by allowing the sale of products at locations like farmers’ markets," and help promote BC tourism, as many visitors to our province take in local farmers markets and festivals, is one CAMRA BC has been pushing for and I do believe CAMRA's campaign to get BC craft beer into BC farmers markets has played a huge role in making this idea a reality. It all started last March when CAMRA BC representatives met with several NDP MLAs in Victoria to present a list of wants to who CAMRA thought were going to be the ruling party after May's provincial election. On that list was the idea of having craft beer and wine made available for sale at local farmers markets, an idea, that at the time, was a pipe dream at best. 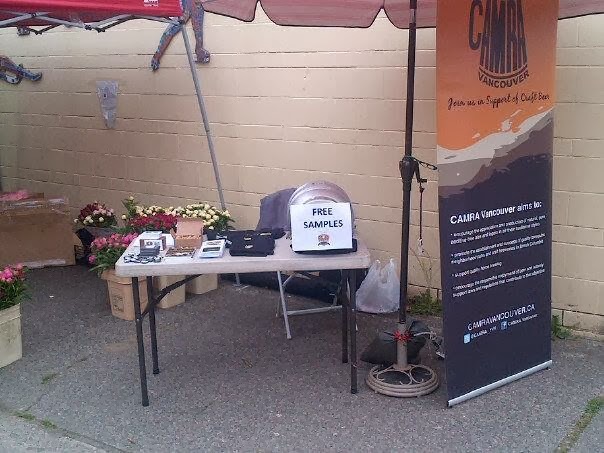 Well, as we all know, the NDP failed miserably in the election, but that did not deter CAMRA BC, specifically Vancouver president Adam Chatburn who took this on and pushed further by securing booth space at several Vancouver-area farmers markets this past summer. Chatburn cleverly drew people to the CAMRA booth by having an empty cask of beer on the table with a sign, "Free Samples", and once at the table, market goers could see in fine print, "not available here" at which time Chatburn and his CAMRA representatives educated their audience on how BC liquor policy made this sort of activity illegal and offered them form letters to sign requesting that craft beer be allowed for sale at farmers markets. According to Chatburn, that letter writing campaign resulted in Yap and Anton receiving over 400 letters, a number large enough to immediately get the attention of any politician and in this time of liquor policy review in the province, I can guarantee you Yap and his team were looking at this idea before the consultation even began. In fact, I had been told from a very reliable and well connected source that beer and wine in farmers markets had already been rubber stamped as a "go" before the consultation was even in full swing and that this would be one of the first announcements, something that appears to be true. The fact that Clark herself made the announcement tells me this is a done deal as Anton is not going to upstage and over-rule her boss by watering down the recommendation or by putting the kibosh on the idea. The farmers market idea was also apart of the CAMRA BC presentation to Yap and his team during the stakeholder meeting phase of the review and I can tell you the idea was very well received and I, for one, was surprised when it became apparent that the Liberals were considering allowing free samples to be given out as well, which, as you can see by yesterday's announcement, seems to be what is coming down the pipe. I know this is apparent victory is not 100% due to CAMRA BC and Chatburn pushing as the wine industry were advocating for BC wine sales at the markets as well, and now that Christy Clark is representing Westside-Kelowna, prime wine country, the wine folks will even have more influence on the Liberals than before. Having said that, CAMRA BC members should be proud of what their executives have done to put this on the Liberal radar, especially Chatburn and his Vancouver Executive who took this on and raised awareness by getting the booths at the markets. This is why CAMRA exists, to advocate on behalf of the craft beer consumer of BC, and it appears they have chalked up one major victory for those of us who enjoy great BC craft beer. Lets hope they have many more successes!